If the bedroom is a sanctuary, the bed itself is the ultimate place of rest and restoration; it is the focal point of the room. As such, it should be comfortable, comforting and cosy. I have two pretty, floral Cath Kidston duvet covers which I alternate throughout the year. Both are predominantly white, but are covered in beautiful, colourful flowers. I also have two cosy blankets which lie across the foot of the bed for extra warmth on a cool evening; one is a reversible pink and white polka dot blanket from Laura Ashley, which complements the colours in both duvet covers and the second is a chequered Cath Kidston picnic blanket, which is a medley of pretty summer colours. This gorgeous Cath Kidston duvet cover (‘Rosali’) has red, pink and green flowers on one side and red and green gingham check on the reverse. This pretty duvet cover (Cath Kidston’s ‘Floral Bouquet’ print) works really well with the two snugly blankets at the foot of the bed. These two cosy blankets complement the pretty spring colours in the duvet cover. The bold colours in this duvet cover provide inspiration for a pretty palette for other furnishings. When I change the duvet covers, I also tend to swap around the cushions that I pile up at the head of the bed to match the pattern and colour of the duvet. This is a really quick and simple way of giving a room a new lease of life, or of changing the colour themes without having to redecorate. 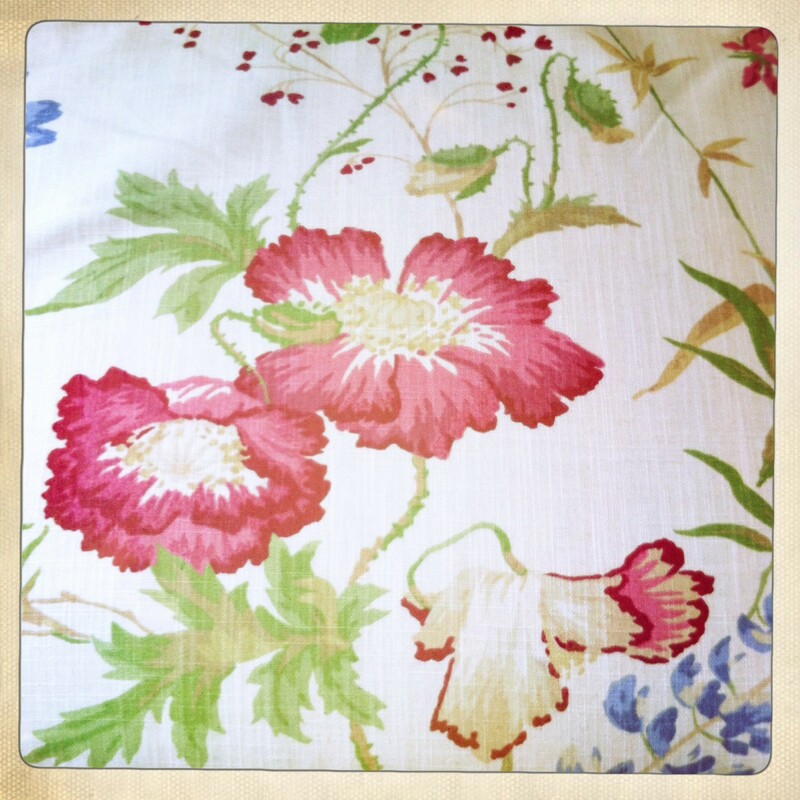 These pretty cushions match the colours in the ‘Spring Bouquet’ duvet cover. Look for soft furnishings which complement the colours in your duvet: these Cath Kidston spotted cushions draw out key colours in the ‘Rosali’ duvet cover. Along with the smaller cushions, I hand-sewed these patchwork squares onto a large plain blue cushion cover which I had had for years and thought was a bit dull. I used lots of left-over scraps of fabric from different projects (both from my sewing box and my Mum’s) and when I had finished, I hand-stitched lace around the edges. It is a really comfortable headrest and a beautiful reminder of the stories behind each piece of fabric and of my own achievement in sewing it. These gorgeous paper roses run across the head of the bed and add a vintage, romantic feel to the room. These delicate hand-made roses work well with the floral theme in the bedroom. I have used the colours in both duvet covers to make two separate sets of bunting which hang across the bedroom ceiling. One has flags in three different patterns – red gingham, Cath Kidston Stone Roses and a white, floral pattern and the other is all made from the same white and floral fabric. I made this second string from some left-over fat quarters folded in half and sewed onto some pink ric rac, trimmed with lace. It was a really quick afternoon activity and a great use of left-over odds and ends. 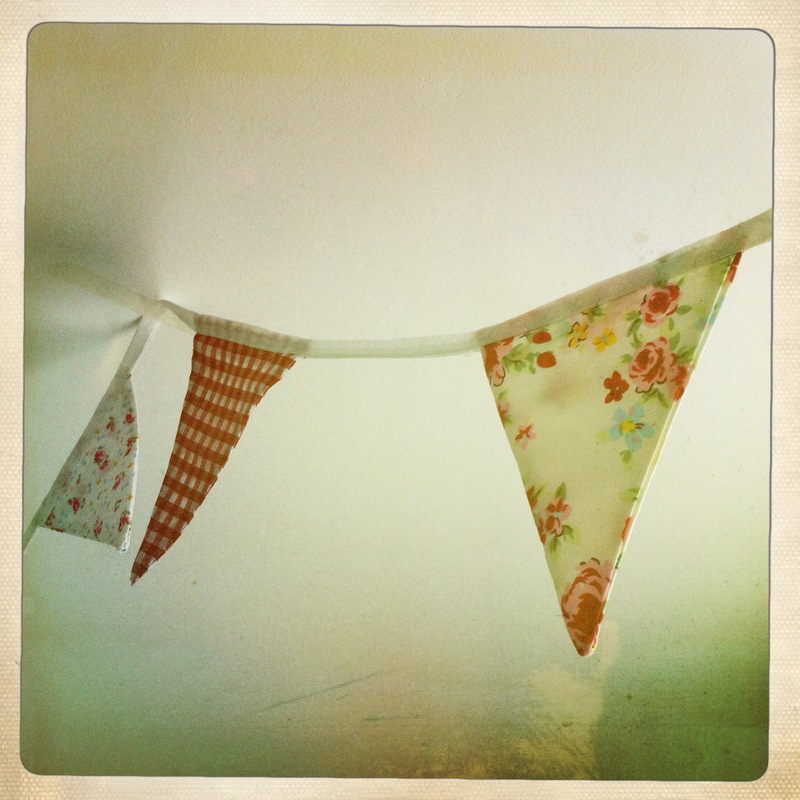 Bunting gives a real vintage feel to a room and is really quick and easy to make – you don’t need a sewing machine, although it will make the process a lot quicker. 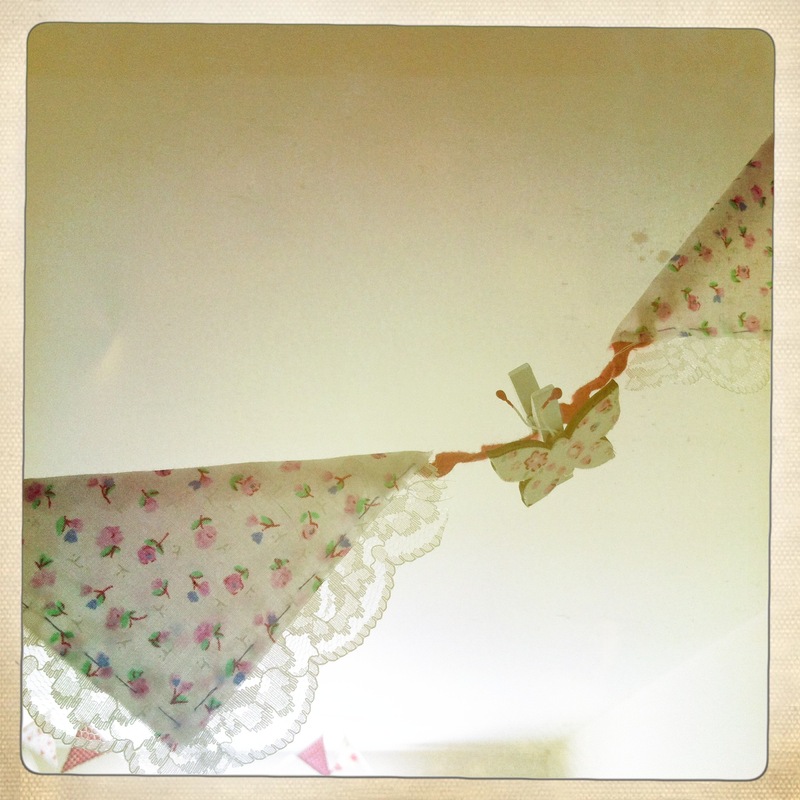 Pretty wooden butterfly pegs added on to this bunting add a delicate touch. This nursing chair was a brilliant bargain – I found it for just £5 in a Charity shop. When I bought it, it was upholstered in a green and yellow striped fabric, but I bought this old-fashioned floral fabric from Laura Ashley and my Mum (who is a sewing-machine wizard), created this new cover for me. 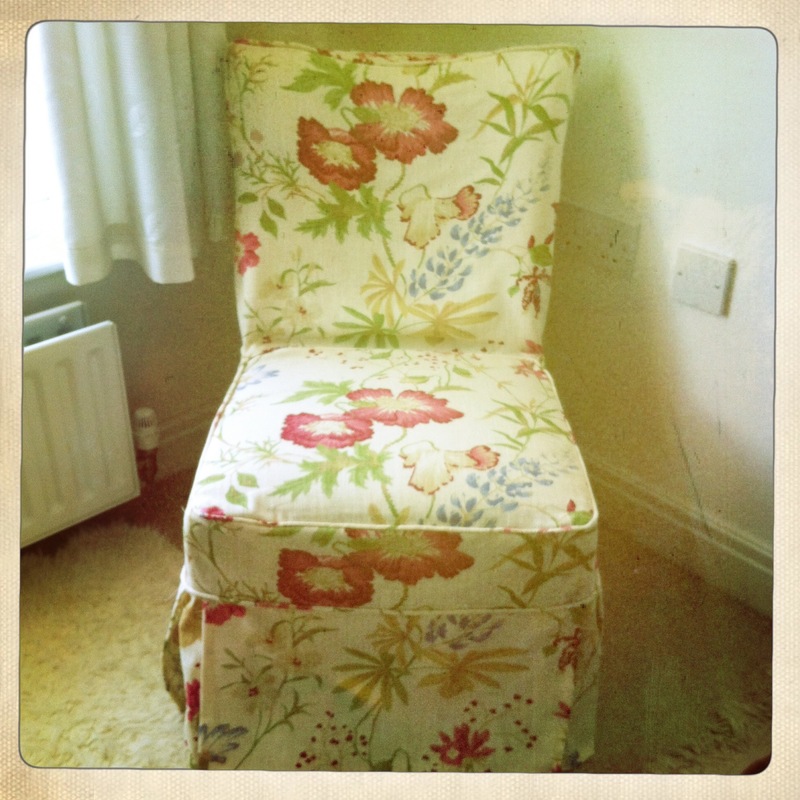 Consider re-covering chairs with pretty fabrics to give them a new lease of life. Look for fabrics which complement the other colours in your bedroom. This genuine vintage painting used to belong to my Granny and I remember it hanging in her guest bedroom whenever we went to stay. I like it because it’s a vintage print, but I love it because it reminds me of her. 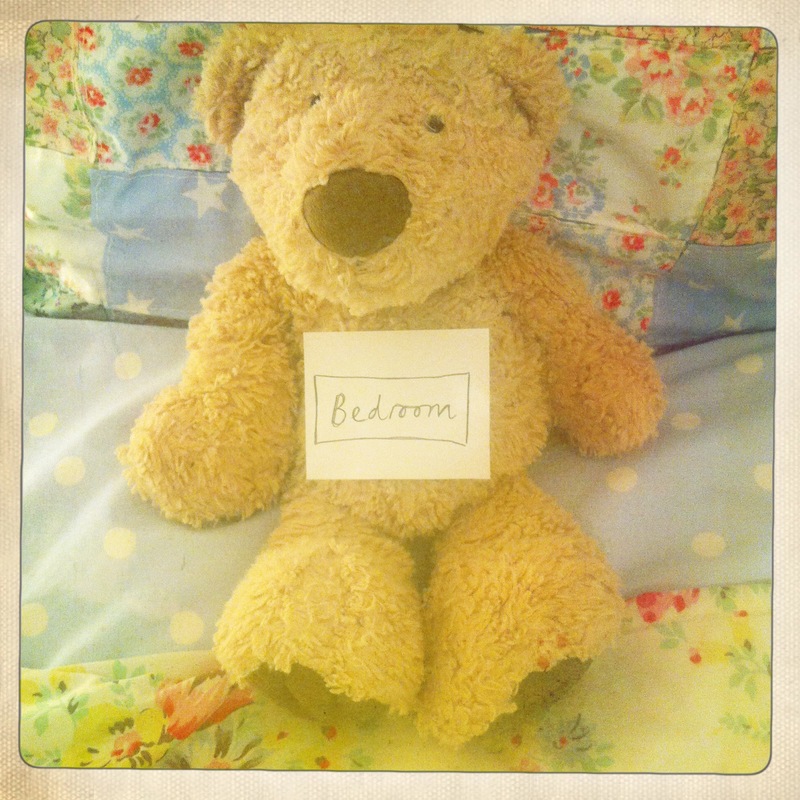 Look out for old-fashioned pictures in Charity shops and at Vintage fairs to add a sense of nostalgia to the bedroom. 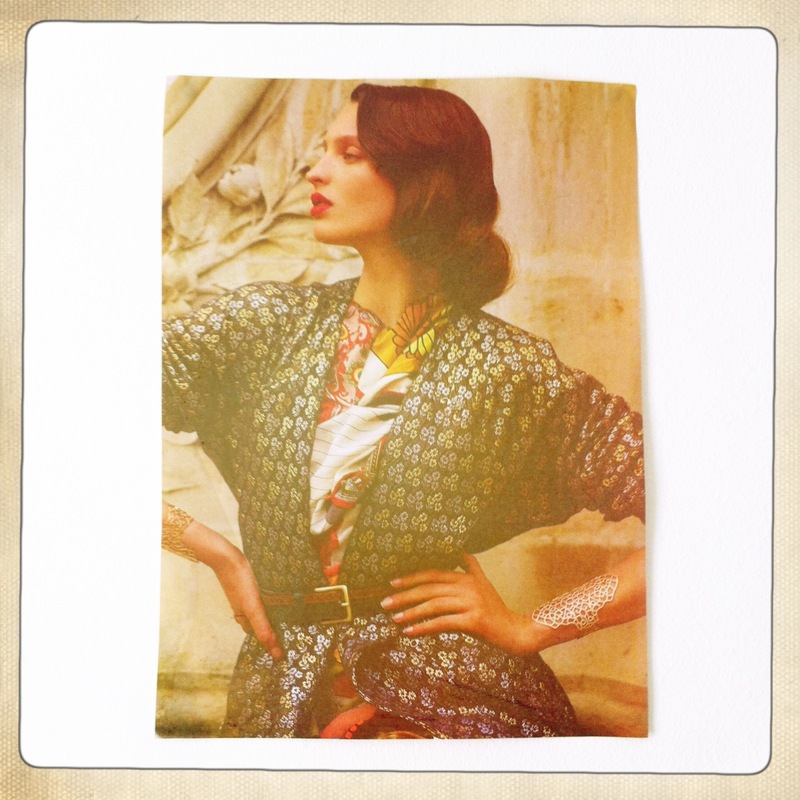 This vintage-style photo was part of a fashion shoot in Elle. I love how stylish and striking it is and I love having it up on the bedroom wall. Look for pictures and images that you like in magazines to create cheap and unique artwork. This pretty lamp was another Charity shop find – in fact I bought the base and shade separately, but I think they look really pretty together. Altogether, I think the lamp cost me £4 – a brilliant bargain and a unique lamp! Look out for separate lamp bases and shades in Charity shops and at Vintage fairs which you can later combine and swap around to suit different rooms. This pretty ballerina statue was a Christmas gift when I much younger. 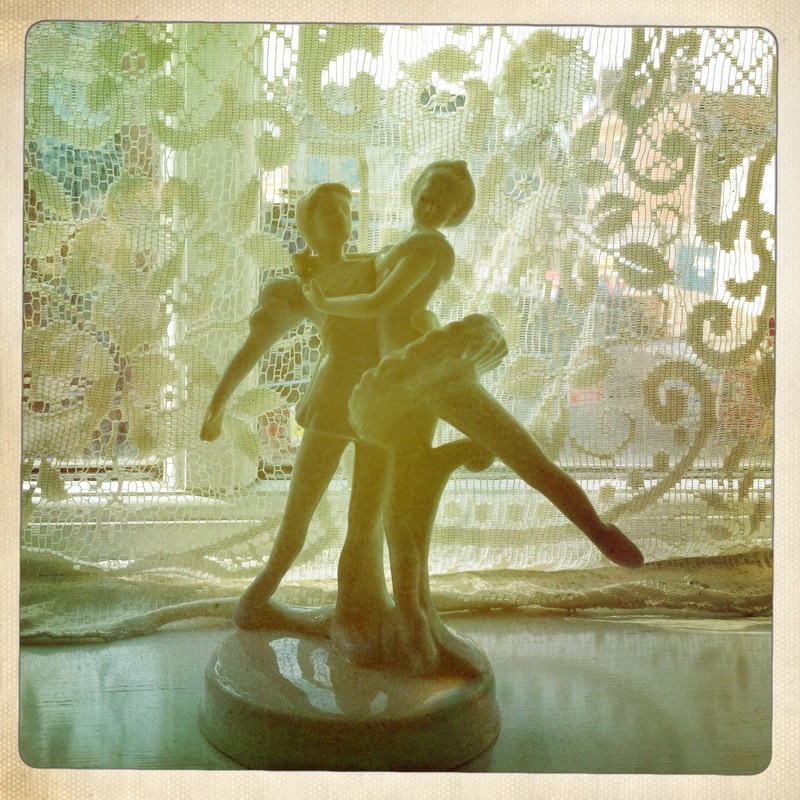 I used to love ballet when I was little and so I love this as a reminder on the window sill. The bedroom windows overlook what was a car park and is becoming a new block of flats, so I have hung a lace tablecloth at the window for privacy. The tablecloth cost just £2 in a Charity shop and I simply looped the top of the tablecloth over a roller and hand stitched it together. It was really easy and makes a much prettier alternative to the opaque, off-white roller blinds which were there when I moved in. Hold on to gifts, even if they don’t seem to suit the style of your house initially – this elegant statue was a Christmas present when I was a young girl, but I still like it many years later. The one thing I miss about living in a flat is having a garden. These gorgeous cottage-garden flowers were pinched from my Mum’s garden and give a lovely feeling of the outdoors indoors. 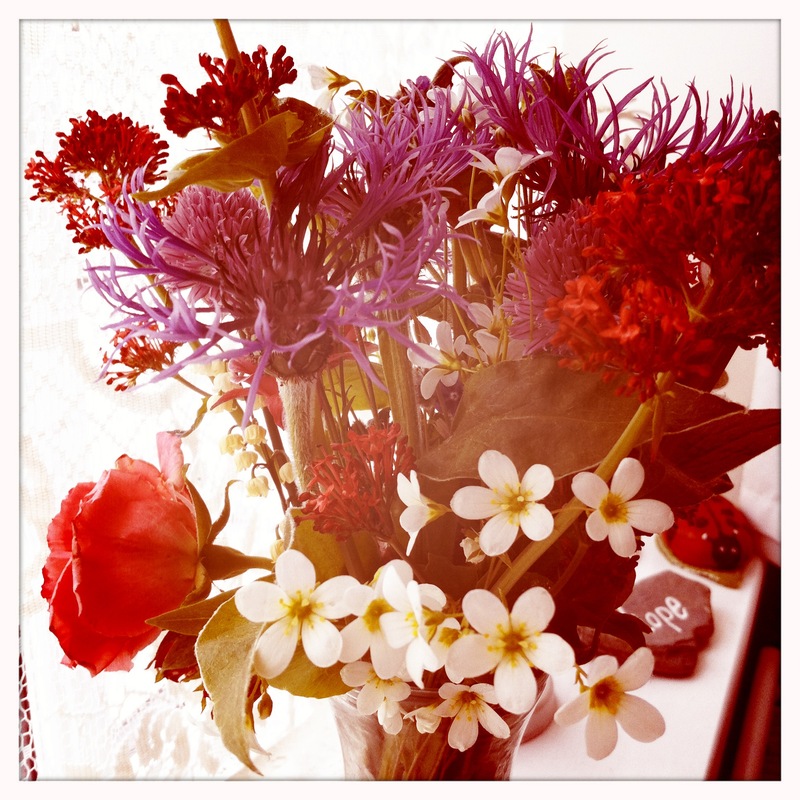 Fresh-cut flowers bring a touch of nature inside. 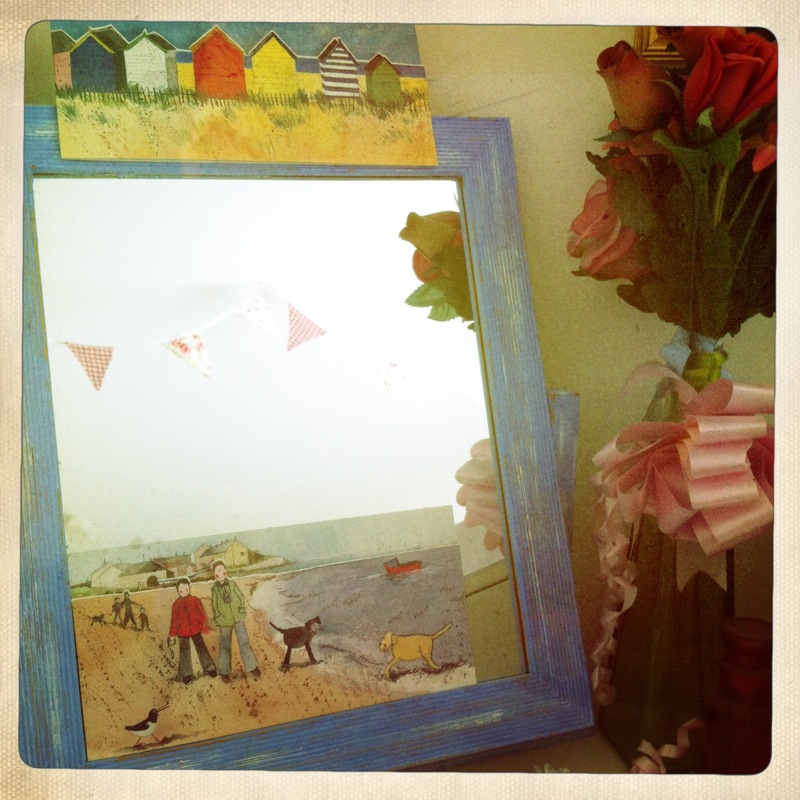 This mirror was originally plain wood, but I painted it with blue acrylic paint and then, when it had dried, sanded it down to create a distressed finish. The two pictures are greetings cards by the same artist which I was given on two significant occasions – they act as lovely reminders every time I look in the mirror. Change the appearance of wooden frames with a quick lick of paint and tuck pretty pictures into the frame to make them unique. 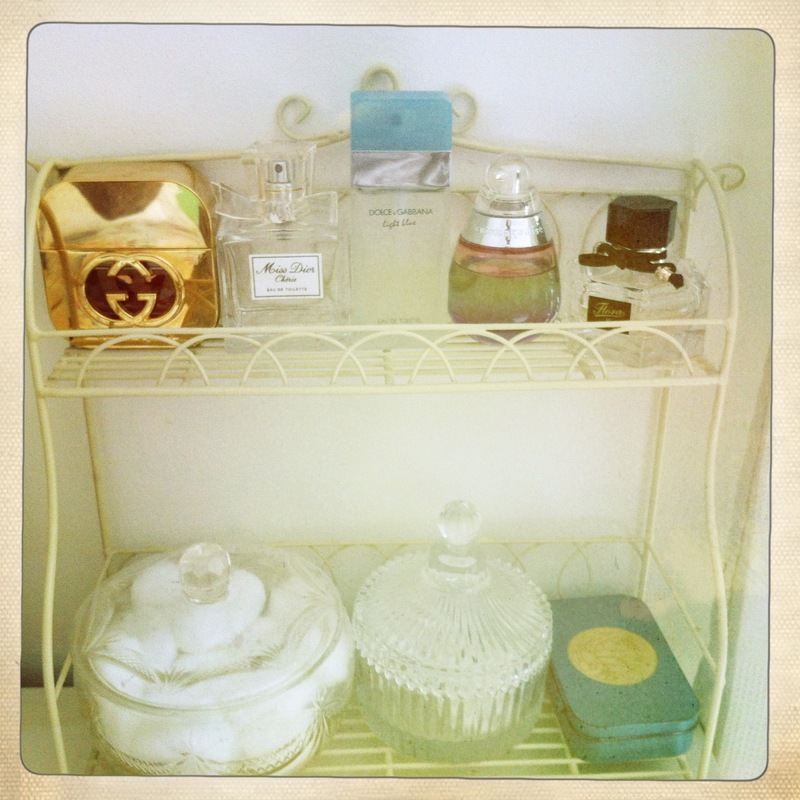 All of my perfumes are displayed on these beautiful antique French-style wire shelves. I think they are probably meant to be fixed to the wall, but I have just propped them up on top of the chest of drawers. I love how all of the bottles catch the light when it is sunny. The glass pots on the bottom shelf were Charity shop finds and make really pretty cotton wool and cotton bud holders. The tin on the right was an old eye make-up tin, which I washed out and decorated with a bit of gold paper from a chocolate box. It now stores all of my hair grips. Look out for pretty glass jars and pots in Charity shops and at Vintage fairs to store beauty essentials – the more mismatching the better in my opinion! This old tin makes a brilliant door stop. It is filled with buttons – which I absolutely love – which gives it enough weight to keep the door propped open. Think about how even ordinary items can be used around your home: this vintage tin makes a useful and stylish door stop.